When it comes to taking photos, I LOVE it! 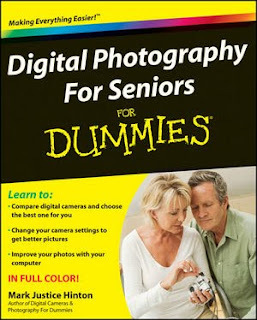 The book, Digital Photography for Seniors For Dummies, is perfect for amateurs like myself, not only seniors, but anyone who enjoys a camera and creating a "masterpiece". The books goes step by step, explaining everything in "dummy" terms for those of us who use a digital camera but aren't technically aware as the professionals are of every f stop, lighting, composing subjects, etc. There are lots of photos, illustrations and instructions for every phase of photography. The first few chapters explain the different buttons and menus. Windows Live Photo Gallery takes users through various tools for editing and organizing photos. It provides lots of useful information and is very thorough. I was impressed with this book, all 340 pages, it seemed to answer all of my questions. It is definitely a good buy for those, like me, who want to understand just how their camera works, and how to take great photos.